"OrthoKeratology" (Ortho-K) is a non-surgical process which reshapes the cornea of the eye utilizing special contact lenses and thereby reduces the dependence upon eyewear. The procedure was discovered over 40 years ago when eye doctors noticed that some contact lens wearers' vision improved after wearing their lenses. Early on, only old-fashioned, hard contact lens material (PMMA) was used. 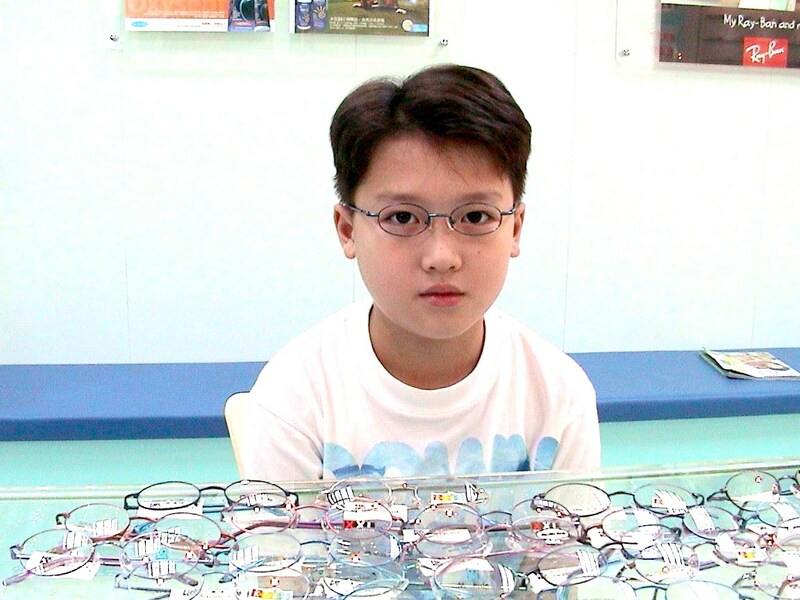 Ortho-K is best suited for myopia (nearsightedness), but studies are underway for hyperopia (farsightedness). The inherent problems associated with that plastic prolonged the procedure for up to two (2) years. Now, with the advent of space-age polymers, computer-assisted lathes, and great technological advancement in the procedure, it is possible to achieve reduction of myopia in a matter of hours to a few weeks. This procedure is know as OrthoKeratology (Ortho-K). The principle upon which Ortho-K is based is quite sound and simple. Basically, an individual requires spectacles (glasses) to see when their cornea is too flat, too steep or out of round in relation to the other elements or parts of the eye. The cornea makes up about two-thirds of the eye's total power to focus the light precisely on the retina (receiving screen) which is located in the back of the eye. By slight modifications in the shape of the cornea, clear functional vision may be restored for a period of time. Recently, several surgical procedures have been developed to attempt to accomplish the same purpose (i.e., changing the curvature of the cornea). Since the cornea is soft, it can continue to change shape as time goes by. The individual prescription may continue to vary leading to increased dependence upon eyewear within months to just a few years after the surgical procedure. Some surgical procedures produce scars causing surface irregularities on the cornea, resulting in permanent blurring that even glasses or contacts cannot eliminate. 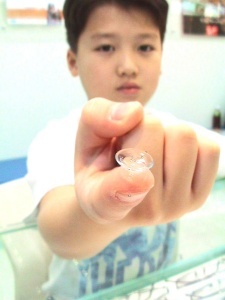 Conversely, Ortho-K is accomplished with a contact lens device that may be referred to as a corneal mold. The mold is similar to a contact lens in its appearance and the way it feels while being worn. The mold is working as it is worn, whether you are sleeping or awake. The procedure takes just from hours (in mild cases) to a few weeks (in very difficult cases) to reach good functional vision. At that point, the mold-wearing time is gradually reduced until a minimal-wear time is established that maintains the corneal shape and good functional vision. This assures continued clarity without the gradual blurring that may accompany surgery. Therefore, the cornea can easily be fine-tuned by minor modifications to the retainer mold. Ortho-K utilizes precise instrumentation to accurately determine the corneal shape before treatment. The corneal topographer"maps" the eye using thousands of points. This enables the orthokeratologist to design the lens for each eye instead of using "stock" lenses. These topographic maps or pictures then are used to determine if the corneal shape is changing in the correct manner. The typical map shows a central red ring (steepened area) surrounding the flattened area. This flat area must be centered over the pupil. Ortho-K is not only an excellent alternative to the wearing of spectacles, but it also frees the individual from the distractions caused by perspiration, dust, wind weather and temperature. There are no more blind spots caused by frame or lens edges. It is great to wear "regular" fashion sunglasses, to get up at night or in the morning and see, to go swimming and skiing, to drive in a convertible with the top down, to work in the dust, grass or in the garden, and to be able to see in cases of emergencies. Ortho-K might open new horizons to you. 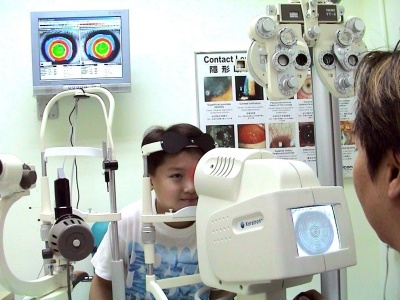 To find out if you are a candidate for Orthokeratology, contact our orthokeratology specialist in HONG KONG VISION CARE CENTRE. What can benefit from Ortho-K? Who can benefit from Ortho-K? How long does it take to be able to see well without glasses? Can Ortho-K be performed on someone who has had surgical radial keratotomy? A child's vision changes. 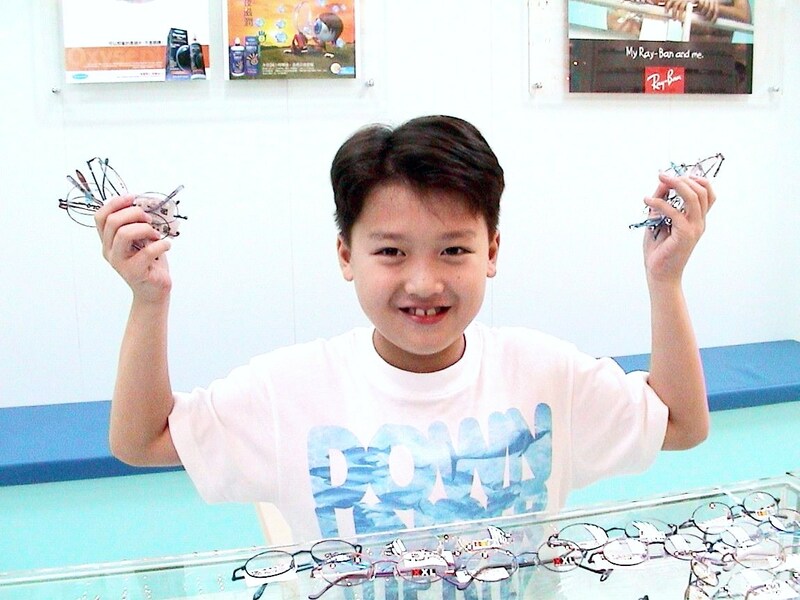 Can Ortho-K help children and teenagers? How much does Ortho-K cost? A Ortho-k is a non-surgical process which reshapes the cornea of the eye utilizing special contact lenses thereby reducing the dependence upon eyewear and providing children myopia control. See www.hkvisioncare.com for more information. Q Is this a new procedure? A Yes, and no. Many of the principles date back to 1962, but the technology is from the computer age. The lens materials available today far exceed even soft contact lenses for providing the eye with the oxygen necessary for healthy vision. 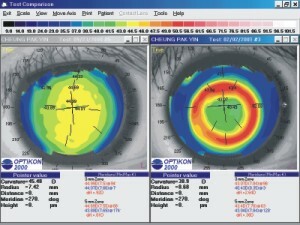 The corneal topographer, an instrument for mapping the cornea, makes Ortho-K a precise treatment. Q How safe is Ortho-K? A Many people have been able to eliminate their dependance upon their glasses and standard contacts with no adverse effects or eye damage. Unlike surgical radial keratotomy, the corneal tissue is not scarred causing poor night vision and compressing corneal metabolism and the flow of oxygen. However, as with all contact lenses, care must be taken to maintain eye health. Q What can benefit from Ortho-K? For those nearsighted children, there are a large number of scientific reports and clinical cases to support that Ortho-K is the most effective way of myopia control for children. Thus, children can benefit as follows. Get rid of wearing glasses or contacts in daytime. Q Who can benefit from Ortho-K? A Ortho-K works best on nearsightedness and astigmatism, but lens designs for farsightedness, and uncorrected refractive error from RK, PRK, LASIK and astigmatism caused by the surgery, are also being developed. Not everyone meets the criteria for A.O.K. Your optometrist will be able to advise you. Q Is Ortho-K for Me? A Ortho-K does not work on everyone. Your optometrist will determine if you are a candidate. Q Will I still have to wear glasses or contacts? A Once the desired level is obtained, the final lenses act as retainers to maintain that level, whatever that level is. This short period of daily or weekly wearing time is customized for each patient. Regular contact lenses are not needed. Glasses may be needed for reading or other parttime use. Q How long does it take to be able to see well without glasses? A Changes in vision can be appreciated within hours to days. Many cases take from hours (in mild cases) to a few weeks (in very difficult cases) to reach stable functional vision. Q Can Ortho-K be performed on someone who has had surgical radial keratotomy? A Yes, in most cases Ortho-K can help uncorrected refractive error from RK, PRK, LASIK and astigmatism caused by the surgery. However, Ortho-K cannot repair the corneal scarring or help the night vision problems associated with the surgery. Q A child's vision changes. Can Ortho-K help children and teenagers? A Absolutely, with the help of Ortho-K, we don't need children and teenagers to wait for their nearsighedness to stable which is probably after 20-year old. Ortho-K is used to retard the progression of nearsightedness and other refractive errors, and leave children and teenagers with a brighter future. Q How much does Ortho-K cost? Generally, the cost is less than 2/3 the cost of LASIK. The actual cost will depend on the complexity of the case. For simple cases the cost can range from HK$12,000 to HK$18,000 depending on length of treatment and the number of lenses needed. Your optometrist will be able to give you a better estimate for your eyes. A After treatment and maximum results are achieved, retainer lenses are worn to stabilize the new corneal shape. Failure to wear the retainer lens on an ongoing basis will result in the return to the pre-existing prescription. Retainers may be prescribed during day or night.